Upon receiving your Doggy GOO ™, because the “GOO” in Doggy GOO is the Best Natural Peanut Butter for Humans, You will See normal Oil / Peanut separation. As such, it is suggested that You move your GOO to a Mixing Bowl for a complete ReMix. Should You find your Doggy GOO to be a little tooo Thick to Spread Thinly, it is OK to Mix in a little Coconut or Peanut Oil. Then, place the Mixed Doggy GOO in the Refrigerator. This will ensure maximum Product Freshness for the Life of the GOO. Healthy GOO ™ recommends continued refrigeration until it has been totally consumed. Is your Dog Well or Allergy STRESSed ? Has your Pet recently traveled or moved to a different part of the country? Has your Pet been acting differently lately or hasn’t seemed like him/herself? Has your Pet been recently Diagnosed with an Illness? / Treated by Antibiotics / Heavy Pharma ? Have you noticed any signs that your pet may be fighting health issues (such as Lethargy, Skin, Ear, or GI issues)? Have you noticed any abnormal behaviors i.e. Irritability ? Has your Dog been Paw Chewing, Itching, Scratching, Scooting, Biting more than usual ? Are Gunky Ears an Issue ? If you have answered ‘Yes’ to more than one of these Questions, we consider your Pet’s Health and Well-Being to be “STRESSed“. Step 3: Determine how much Doggy GOO ™ is best for your Dog. Once you have determined if your Dog is Allergy “Stressed”, You need to determine your Animals Weight. Once your Dog’s Weight has been determined, use the Below Table below to determine the correct amount of Doggy GOO ™ for your Dog. Note: If Your Animal is a Tiny PowerHouse i.e. 12 lb or Less..
May we suggest… Well = 0.5 TeaSpoon and Stressed = 1 TeaSpoon. 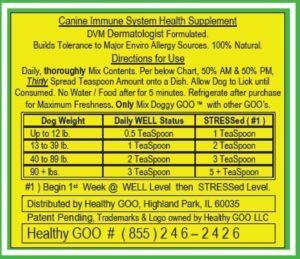 Review: How much Doggy GOO will my Dog Require ? The STRESSed Phase of Doggy GOO’s Protocol is 90 Days. Each Jar of Doggy GOO = 90 Teaspoons. Order enough Doggy GOO to take Your Animal thru the 90 Day STRESSed Phase of Doggy GOO’s Protocol. If Heavy Pharma / Antibiotics have been Consumed in last 3 month, Healthy GOO ” Strongly” recommends MIXing a WELL Amount of www.GooGutRescue.com into the STRESSed Amount of Doggy GOO. After 1 Jar of GOO Gut Rescue has been Consumed as Recommended Above, it is OK to Stop consumption of GOO Gut Rescue and proceed exclusively with Doggy GOO. Following this Recommendation will “Rescue” your Animal’s GUT from Antibiotic Induced Bad Bug Dominance and placed your Animal’s GUT-Biome back to Health / Balance. Then, the Prebiotics & Probiotics in Doggy GOO will take over thereafter. Step 4: The Right Bowl & The Right Place. While it may seem inconsequential, the type and design of the bowl to be used for Doggy GOO ™ is important. Healthy GOO ™ suggests a bowl that has a broad, flat bottom with slightly angled sides. The reason for this is that Doggy GOO ™ must be thinly spread over as broad an area as possible. This type of bowl will allow your dog to conveniently and repeatedly lick up their Doggy GOO ™. The surface onto which you place the bowl is just as important as the bowl itself. Because Doggy GOO ™ consumption is all about vigorous licking, the bowl must be placed on a surface where it will stay put and not move around as the dog repeatedly licks. Step 5: Spread the GOO very Thinly! Now that you have the right bowl and place, it is time to grab a Teaspoon (not a tablespoon). Mix the Doggy GOO ™ after opening as the nut butter and oil will separate over time. Based on your dog’s weight and health status, spoon out the correct amount (see Doggy GOO ™ Feeding Frequency below) for your dog and spread it very thinly around the bottom of the bowl. Should you find your Doggy GOO to be a little tooo Thick to Spread Thinly, it is OK to Mix in a little Coconut or Peanut Oil. While you may think this “Spread very Thinly” request is a bit Crazy, each of Doggy GOO’s ingredients have their own method of delivering their GOO Glow ™ to your dog’s immune system. In the case of Doggy GOO’s ingredients, which build immune tolerance to everyday offending allergens, it is important that these ingredients be in your dog’s mouth as long as possible before swallowing, for them to do their Doggy GOO ™ Magic. Step 6: It’s Doggy GOO ™ Time! Now it’s time to give your best friend their Healthy GOO ™ Doggy GOO ™ Treat! Place the Doggy GOO ™ Bowl in the right place per above, stand back and let your best friend lick until there “Ain’t No More GOO!”. WARNING Do not be tricked into giving your best friend more than indicated on the Doggy GOO ™ Label. While your Dog may very much enjoy more Doggy GOO ™ and a Teaspoon Amount may appear to be small, don’t forget Doggy GOO ™ is a Canine Immune System Health Supplement and not a Treat. It has been Formulated specifically to be ingested in the specified Amounts. If your Best Friend is GOO Crazy for more GOO, Healthy Goo ™ suggests that you split the daily amount into multiple 1 teaspoon servings per day. Note: this can only be done when the recommended amount is more than 1 teaspoon per day, and is not necessary, but is an option if you feel the need to “treat” your dog to GOO throughout the day. Please adhere to the indicated consumption amounts listed above. Ingestion beyond these specified amounts may lead to G.I. distress. 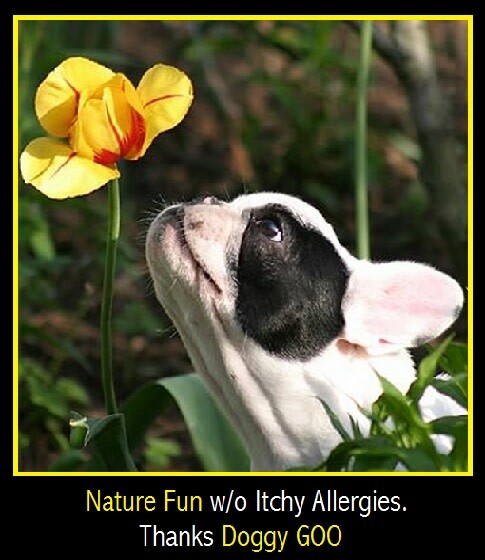 Doggy GOO ™ is a Canine Immune System Health Supplement; please keep out of reach of children. Peanut Allergy Warning! Doggy GOO ™ uses the best human grade, organic nut butter that money can buy. 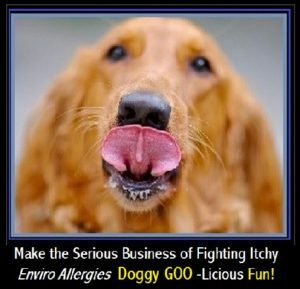 We strongly suggest that Doggy GOO ™ not be used in household where someone suffers from a peanut allergy. Please also be mindful of household visitors that may have a peanut allergy. Your dog’s bowl may have lingering amounts of peanut butter. For maximum Doggy GOO ™ ingredient freshness, it is suggested that Doggy GOO ™ be refrigerated right after purchase and until it is gone. Your Dog will Doggy GOO Lick IT Up!